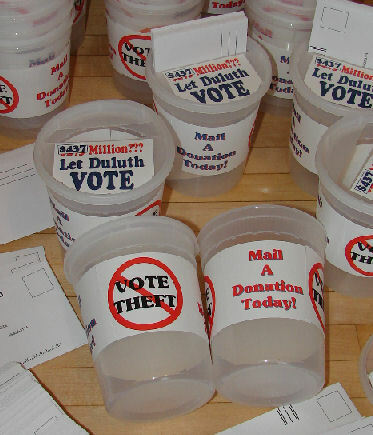 Click pages listed in left column to see what Let Duluth Vote proposes. Its set its Plan B up to be implemented in two phases. The second phase could be changed or abandoned and the money returned to taxpayers or spent in the classroom pending state approval. The Red Plan's supporters fuss a lot about what they claim is an ever changing Plan B. This overlooks the constant changes in the Red Plan which today has elements of the original Red, White and Blue plans which have been added and subtracted on somebody's whim ever since they were trotted out to the public. It continues to morph. New properties have been taken for parking lots. Stadiums have been added then downsized. Plan B must adhere to the 75 words in the Plan B Petition. Like the Red Plan there are numerous ways to implement Plan B. Board Chair Tim Grover originally drafted the Plan B petition and recommended that Let Duluth Vote circulate it because this might be accepted by the School Board as a sensible "compromise." Well, we know how that worked out. Now, a year after the original petition was handed to the School Board, under the orders of the Attorney General and The Minnesota Dept of Education Dr. Dixon's Administration is finally going through the motions of putting together a Plan B proposal for the State's Review. By now it is now impossible for any referendum on Plan B to be offered to voters before the construction on most Red Plan projects is well under way. 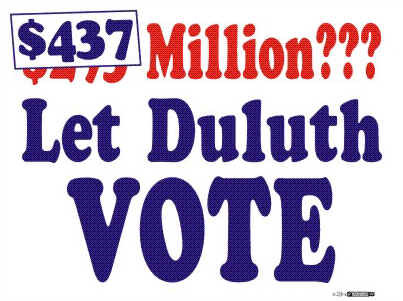 Nonetheless, the Board set aside $250,000 to develop a plan for the state over the objections of Let Duluth Vote. We don't need that much money and resent being told the money being used to finance it is also meant to fight Let Duluth Vote in court. 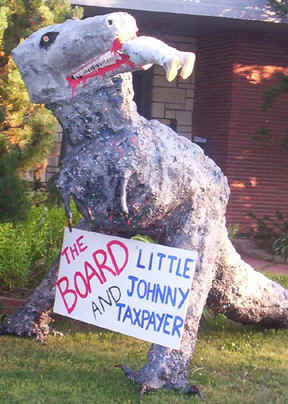 The School Board only did this to make the public mad at Let Duluth Vote for wasting precious resources during a time of financial ruin brought about because of the District's reckless spending. The School Board "borrowed" $5 million for classroom spending to pay for the Red Plan then announced they would gut Ordean Junior High two years ahead of schedule to save $750,000. If they simply transferred the $5 million back to the classroom this would be unnecessary. Gutting Ordean will require all its 7th and 8th graders to be sent to Woodland Jr. High. It will force Woodland Jr high students to be bussed to Morgan Park Jr. All the Ordean and Woodland sixth graders will be parked in Grant elementary and all the Grant students will be sent to Nettleton and all the Nettleton students will sit out the year without school........We're Sorry. That last part was just a joke added to the School Board's joke. How this much disruption and the transportation costs to pull it off could permit any savings is a mystery. Meanwhile the School District posted a Request for Proposal on Tuesday to put together a Plan B proposal that could only be put into effect if the District stopped the Red Plan which we know the Board won't do on its own and a non binding referendum on it passed and a new School Board elected this November and seated in Januay.